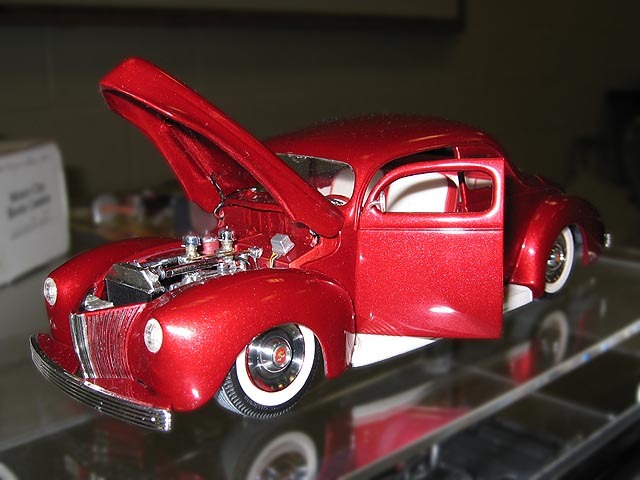 One of the most renowned model car builders in our club is our own president, Lyle Willits. Over the years his work has been spotted around the world in model car enthusiast magazines and now we're finally including his work here on our web site. Starting with Revell 1940 Ford Sedan kit and a new resin offering from Modelhaus, a chopped and sectioned 1940 Ford body, Lyle cut open and hinged the doors (he hinged the hood, too). He also frenched the headlights and sunk the taillights and license plate. Nope, that ain't candy-apple red paint on it. It's Tamiya Mica Red and it sure looks good (Lyle used a load of polish to get that shine). Lyle made the filler panels between the body and the custom bumpers from an AMT 1940 Ford Sedan Delivery kit. Wheels are Cadillac Sombreros from the Model Car Garage and tires are Lyle's last set of Satco 50's style whitewalls. The nifty rear view mirror on the driver's side door came from Bob Aselta's Scale Repros Plus.